After quite a bit of fooling around, I finally got the USB D-104 Mic project working. This is a D-104 Mic that will plug directly into a computer via USB. Everything is self-contained within the microphone or base itself. The condenser element is a whopping 34mm, AKA 1.34 Inches in diameter. So it's pretty big. The capacitance of the mic element is approximately 50pF. 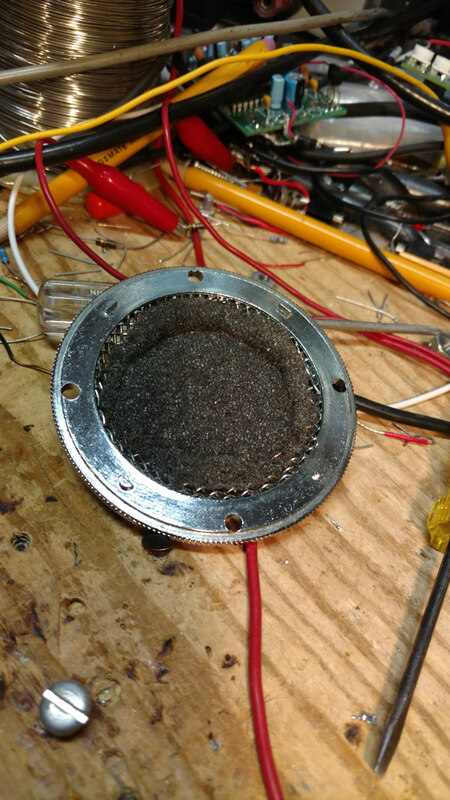 A big challenge was constructing an amplifier that would have a sufficiently high input impedance as to not load down the element. I used a 1 gig ohm input resistor, looking into a j-fet with very low gate c (approx. 4pF). The gain of this amplifier is approximately 40, and the amplifier is co-located within the head to keep stray C to a minimum. The output voltage from the amplifier-element combination with very loud speech, close talked is over 6V P-P. This is excessive, and the normal output is about 1V P-P. The element requires high voltage - much higher than 5V which is the USB voltage available. So, a 5VDC to 24VDC converter is used to get sufficient voltage to run the element, and the associated analog circuitry. In the base is further analog amplification, to bring the level from the head (with normal-loud speech) up to around 4V P-P for the input to the Analog to Digital converter, which is part of the microprocessor unit located in the base. The microprocessor is a Microchip PIC which contains the A/D converter, hardware interface for USB and many other input/output combinations. I wrote the software that runs on the microprocessor. One of the pins on the chip is used to facilitate transmit/receive control from the switch in the mic handle. When the switch is open (receive), the software in the microprocessor detects the T/R switch is open, and writes all zeroes (0s) to the USB data buffers. This allows software to detect the presence of anything other than zeroes as a key to transmit/receive. The mic otherwise behaves like a standard USB microphone. I included a line level analog output for in-shack operation and direct connection to an audio console or other analog input. Included in the head is material facilitating a pop filter thereby reducing breath pops, etc. to a reasonable level. Audio fidelity is excellent - Listening, I believe it is better than the Behringer B1 I usually use ! The element is unidirectional (which is what I wanted), so off-mic sounds are significantly reduced. This is the 2nd USB D-104 Mic I've put together. 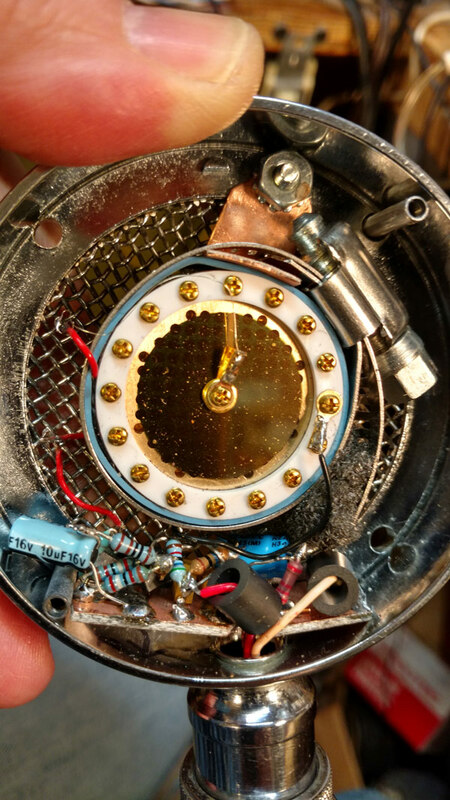 The other one uses a Radio Shack electret condenser element. I like the look and feel of the D-104. Maybe Bob Heil might be interested in producing something like this ? Very nice implementation, Steve! I wonder if you will be providing additional information, such as the circuit, the code running on the PIC micro-controller, mic element ID and source vendor, etc. I have been able to reach as high as 10 megohm input impedance with jfet input op-amps, such as the LF-353, but you have gone way beyond that for the ultimate low frequency response. 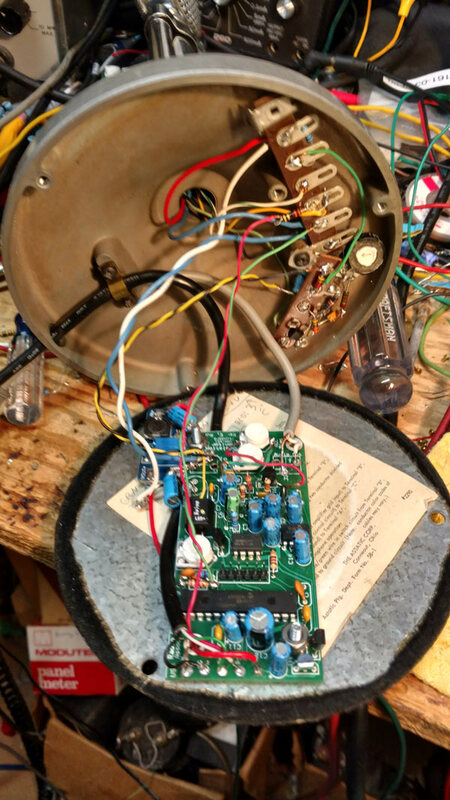 Having everything needed to interface to a PC in the microphone head and base is quite a feat. Interesting that you avoided wiring capacitance in the neck of the mic stand by putting the pre-amplifier in the head. Very nice! Looking forward to additional information as time permits. Thanks for sharing! I am most impressed by the sophistiated mounting system for the condenser element! That and the radical construction technique for the head preamp too! even built off shore... imho. 1. Will there be a kit / product offered? 2. Not clear - can this be used with an original D-104 element? I'm not QIX, but the upper part in the head is for the condensor element. The bottom part converts to USB, that's the green board. As Bear pointed out, there are easier ways to do this if you just want the D-104 to be a microphone, and interface to USB. There are dongles and interfaces on Ebay that will do it. These wouldn't work for my application because I wanted to use the PTT switch in the D104 to in fact control my transmitter via remote control and have everything come over a single USB input. And, I wanted foolproof control. This required a custom USB interface that would send 0s when the mic PTT switch was open. I have found that simply disconnecting or shorting the output of the microphone was not sufficient. The analog noise present in all mic preamps would generate enough signal to mock pauses in speech, so I could not absolutely know that the user indeed went to receive. Software: The remote control software I use is available from my website: http://remham.radioassociates.com. The firmware - I could make the firmware available. You would have to have a way to program the PIC. Or I could program the PIC. The PIC side really needs work. There are lots of possibilities here. There are, no doubt, other (and possibly better) ways to do this. But, it was/is an interesting project for sure. The elements are available for less $$ on epay and with USA based shipping too! Just picked up a pair! I like you project very much. It does remind me at my days as a school practicant in the radio studios in the Netherlands more than 55 years ago. The NRU (Netherlands radio union) made their own studio condenser microphones. In those days, there was no metalized foil for the membrane, so they nickel plated SS and pealed off the nickel. Made nice membranes. Great work Steve, it must have been a joyful way to spent you time. I like to try that as well, but without the digital part. I consider this project a multi-sided approach to modifying the ol' "D-104". Not only have you replaced the crystal element that are ALL getting old and replacements unobtainium, you have also interfaced it with USB/PTT.. Fantastic and nostalgic project! Most large capsule condenser mics commercially offered that I've seen the guts of (too many), are suspension-mounted INSIDE the head. Not only that, but are also "hung" on external suspension mounts to reduce sub-sonic "handling" and vibration that they are capable of reproducing. All the D-104's that have been around here exhibit "handling" noises, loose head vibrations, etc. Have you noticed those artifacts? During the first attempt, I suspended the element within the head. I found this to be problematic, in that the suspension exhibited a certain degree of "springy-ness", and this translated to very low frequency artifacts being constantly present in the audio. So, decided to go the other way - with a very solid, positive mechanical support. This works quite a bit better, and the handling artifacts are very much reduced. 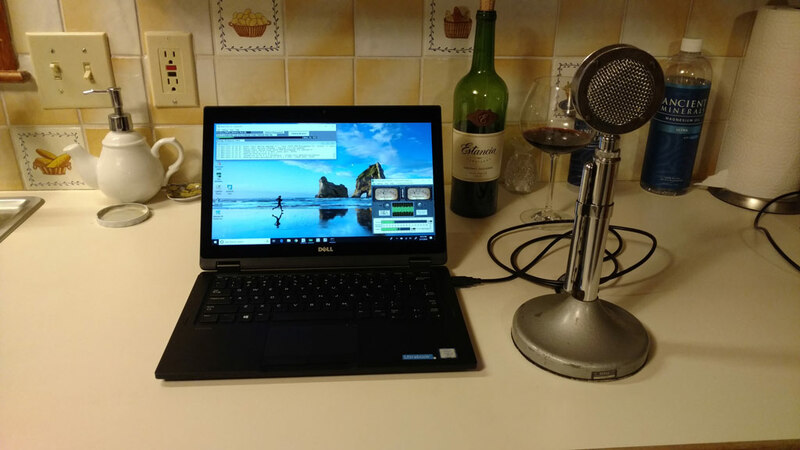 It's best of course if the mic stand is sitting on a table, but it's actually not bad if one holds the stand while transmitting. I ran a lot of tests. I have a 77-DX mic with from which the ribbon element was removed well before I got it. This is an excellent candidate for one of these 34MM elements and I intend to do this project next. Will not be USB - just an analog output. The audio quality from these large elements is quite impressive ! I read an interesting article on the Neumann website regarding large vs small diaphragm condenser microphones. Apparently, size matters. Yes, the aviation clamp really set it off! Ya done gooder again, Mr. Steve.